Do you ride Deer Creek Canyon? 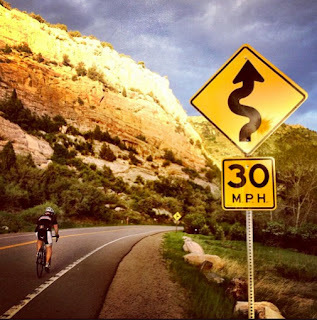 For those Colorado cyclists who ride Deer Creek Canyon most weekends (when it is not snowing, which I believe still happens occasionally), there will be a community discussion for cyclists and community members - tomorrow night, Wednesday, April 24 from 6 to 8:30 p.m - to discuss cycling in the canyon. This is a canyon with a troubled history, but a glorious ride on a bicycle. Discussion is good and we never want what happened to Dirk Friel last year in Boulder to continue to escalate in Deer Creek Canyon until someone is injured seriously. Which almost happened last November to Byron Nix, who was hit, but is okay. 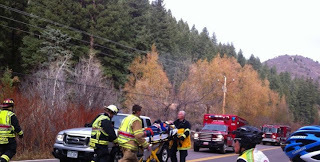 Read and see more: Pickup hits cyclist on popular Littleton riding route; driver blames cyclists. I reason that if the local neighbors who drive this canyon meet some of us face to face they will realize we are mothers, wives, daughters, sisters, fathers, husbands, sons, and brothers. We go to work every day and have families, not the kinds of people who deserve to be injured by a vehicle. It is also time for us to hear how scary it can be for a driver to navigate around cyclists spread out across a winding mountain road. And to remember this is also the neighborhood which cultivates the wonderful volunteers who supply one of the best rest stops for cyclists in the area. I say safety first, combined with a healthy dose of consideration. I felt it was time to show up as part of the community of cyclists, to put a face and voice behind the lycra and helmet. Both BikeJeffco and Team Evergreen have been involved in these meetings since last year. Join County Commissioner Donald Rosier, your neighbors and some people who like to ride bicycles in the area for an open house to discuss issues raised by both motorists and cyclists on roads in the Deer Creek Canyon area. The open house will be held Wednesday, April 24 from 6 to 8:30 p.m. at Sampson Community Club, 16150 W. Sampson Road in Littleton. The Board of County Commissioners is looking for some realistic solutions to some real problems, and they need your input. 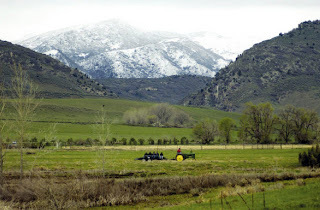 16150 W. Sampson Rd, Littleton, Colorado - this is located off Deer Creek Canyon Rd between South Valley and the High Grade turnoff. This is the one word that would summarize the meeting last night about cycling in Deer Creek Canyon. As is typical with many meetings, there was a lot of filler words and wishes without much real education or solutions. Mostly there was a ton of empty complaints, frustration and hate by the neighbors who live along this popular cycling route. So much hate that even the speakers (a local County Commissioner and Police Lieutenant) tilted their speech to appeal to the neighborhood view only. I don't blame them. It was ugly and counterproductive until the end of the meeting when those who truly wanted action still lingered. Some ideas were good: Better signage, more rest stops with portable toilets, metering traffic, cyclist education/community reach, special designation of the road, having the cyclists register and wear a badge of sorts that they have read the local laws, greater enforcement of traffic laws. Some ideas were ridiculous (although change happens): closing the road to all cyclists (motorcycles and car touring clubs are also a problem), creating a toll road (on a public maintained road), forcing all cyclists to register for a license to be displayed like cars, building a bike path up the hill (way too expensive, plus road cyclists cycle on the road, not on paths. This would also require land from locals). I have always considered my role on a bicycle to be that of a good ambassador for the sport. 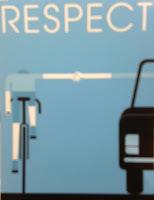 If I miff-off a driver in a car with my behavior, he/she could take it out on the next cyclist they see. If you wear a team kit, represent your team with honor. If you wear a helmet, it means you take your own safety seriously. This is important, an angry citizen in a vehicle is a frightening harmful combination. Every time they are hauled into court and charged - I applaud. Please do not liter your bar and gu wrappers on the road (considered littering). Please do not ride double-file in the road (considered obstructing traffic on a winding road). Please briefly pull to the right and let a descending car pass you, then continue descending (considered considerate, something we all wish every RV would do on our local mountain roads). Please do not stop in the center of the road for any reason, pull completely off the road to wait for your friends. Absolutely pull over and stop your bike along the side of the road when a local emergency vehicle is attempting to respond to an emergency (as a vehicle is required) . Absolutely stop at all Stop signs (as a vehicle is required). Absolutely obey the speed limit (as a vehicle is required). Absolutely do not urinate along the road at any points other than those with designated porta potties, the entire canyon is private property (considered both trespassing on private land, and indecent exposure in public). This last point, plus the "arrogance" of certain cyclists on the road is what most annoys the neighbors of this community. They are angry, there is no denying that fact. I believe there is a collection of cyclists that are ruining this canyon for the rest of us. It honestly makes me scared to cycle in this area. And that is what I most fear: loss of my freedom. So please participate and behave like a good citizen even while on a bike. Let them be the haters, not us. Please keep the local police number on your cell phone and report any incidents immediately to build a history against specific harmful drivers. Our collective goal as cyclists should be to keep ourselves and the next cyclist up or down the road near us - safe. I should also speak up to say that I used to ride that canyon almost weekly. I have been unsafely buzzed by cars, almost ran off the road, shouted at, thrown at, and I have never broken the law in the canyon. I do not deserve to be treated that way. I always ride as far right as possible and usually solo. This is a public road. Mean bad drivers are mean bad people, period. Follow-up 4/30/13: A terribly one-side article in the Columbine Courier, Cyclists, residents discuss road safety in Deer Creek Canyon, By Daniel Laverty. Follow-up 05/14/13: There will be another "community" meeting and cyclists can go (that is a different phrase choice than "welcome"). Attend if you can to lend your voice - Bike Jeffco meeting, Tuesday, May 14, 7:00pm to 9:00pm, at the Jeffco Government Center, 605 Johnson Road, Golden, Colorado. When will cyclists get their side of the truth out there? Sure bikes annoy, but cars kill, and people are always at the center of the problem - on both sides. I personally think Deer Creek locals are spreading publicity as if this is a widespread problem in other areas. I have not experienced near the hatred from other neighborhoods in Colorado. 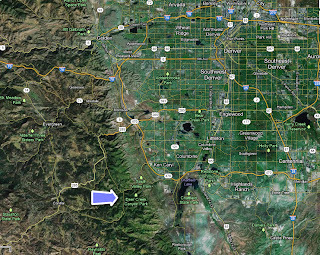 The only other problem I have encountered is on the connecting road to Carter Lake in Boulder county where cyclists must merge onto a county road for 1/4-1/2 mile. Larimer County has had it's problems as well. Most of Colorado's citizens can be quite courteous. Deer Creek resident's are spreading the word that animosity against cyclists is justified. As long as I am a smart and considerate cyclist, I only ever have problems on Deer Creek Canyon Rd, which sadly is pretty consistent. 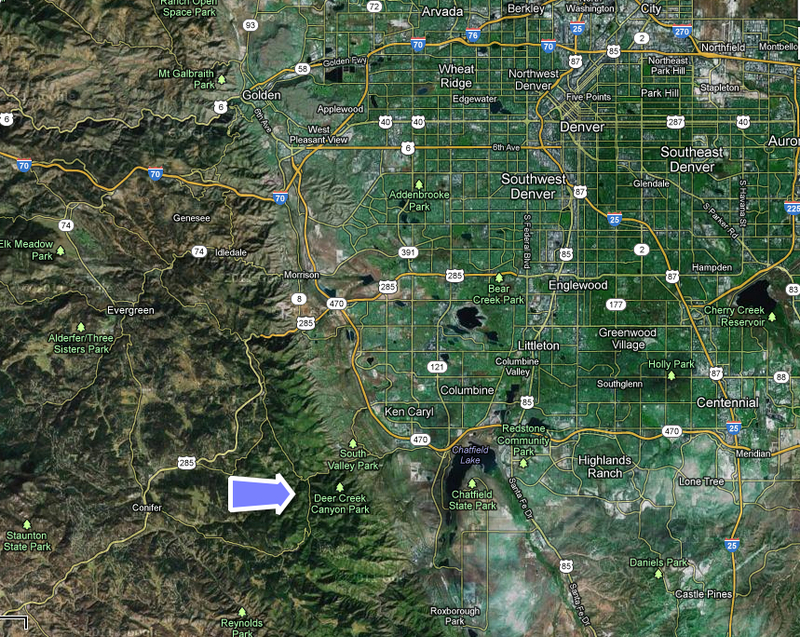 Update 06/06/13: Article in The Denver Post: Tension mounts as 881 cyclists, 1,412 motorists share Deer Creek Canyon. 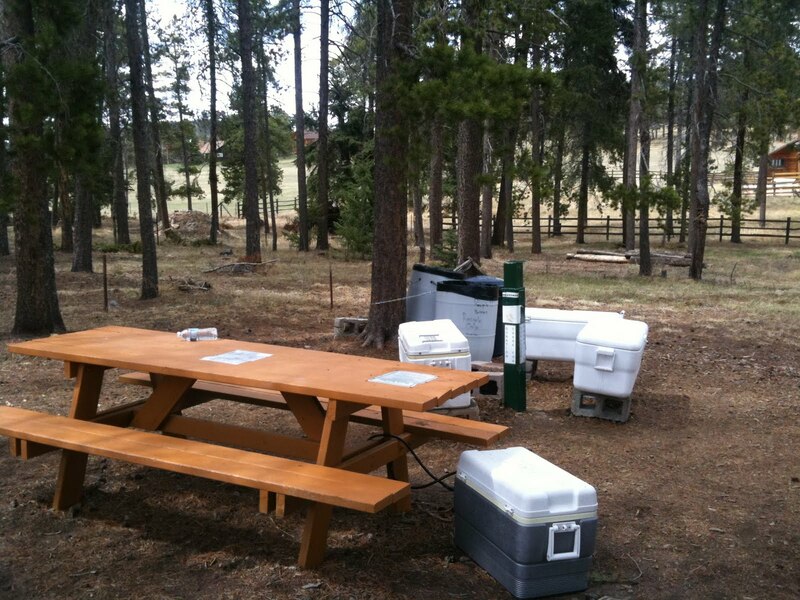 Chatfield reservoir is nearby with plenty of facilities both flush and porta potties. There is also a restroom near a hiking trailhead on the way up the canyon, on the right side of the road. Definitely use one or the other before starting your climb. 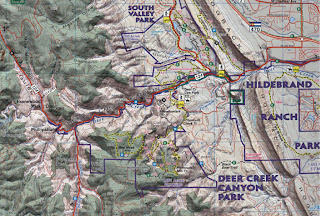 The rest stop up High Grade Rd (labeled Pleasant Park Road on this map) is the source for water on the climb (seasonal; bring dollars to contribute to the water in the honor system coolers mentioned above). There is also water at fountains in the reservoir (seasonal).